Professional beader, Ruthe Kanakoff has made a detailed instructional video showing the complete construction of beaded wire flowers. The Victorian art of making beautiful bead flowers on wire has been brought back to today's crafter by Ms. Kanakoff. This video, filmed in extreme close-up (by her daughter, Susy) is well received by professional beaders and amateur crafters alike. Ms Kanakoff covers basics from choosing tools and opening a wire spool to advanced bead and wire handling for a well constructed piece. 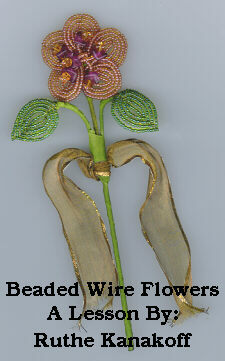 Each step of the construction of the flower is presented, showing the proper hand positions and wire wrap angles. The run time of this video is one hour and two minutes. Be sure to watch this tape to the very end for a fun finale! % 21st Century Scientific, Inc.